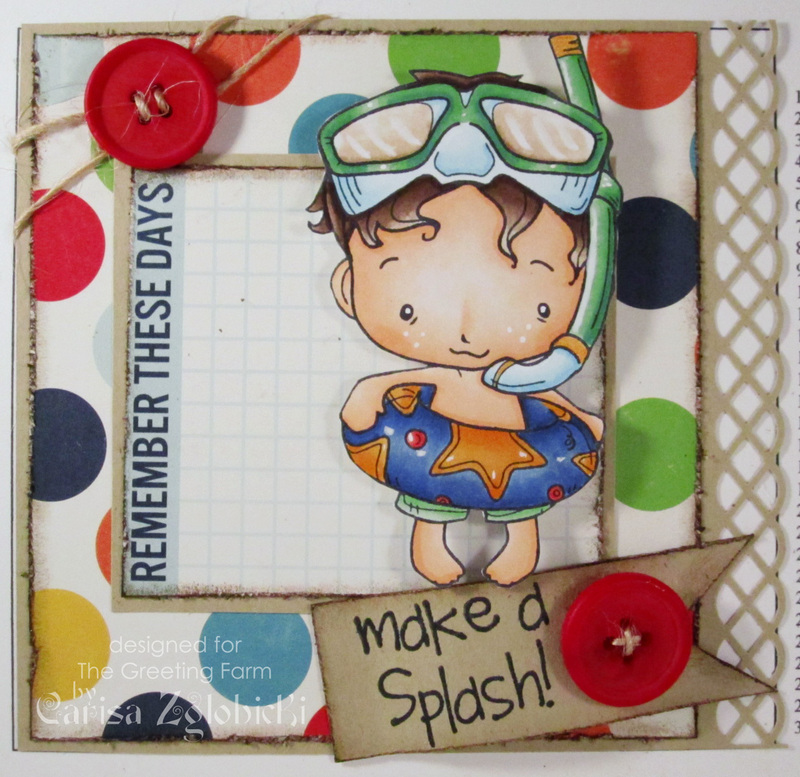 Inky Fairy Designs: TGF's Blushin' Into Summertime Blog Hop!!! My project today features the always adorable Oliver from the new OA-Summer Fun set. I couldn't wait to color him up after seeing the amazing inspiration from the rest of the DT on Tuesday and I knew he would be perfect on my birthday calendar that I'm slowly but surely completing! :D It was such a challenge to color his goggles just right but I think they came out alright - I used a LOT of colorless blender on them to make it look like you were looking thru them to his hair. Then I added a few strokes of Copic Opaque White to accent them. Here is a little closer look - I also followed fellow farmer, Jen Shults Deconstructed Sketch Challenge for my project today! Thanks so much for the awesome welcome as a new TGF Farmer this past week. I can't believe we're already through with our first week of previews and I'll be seeing you VERY soon around blog land. Good luck to all who enter and ENJOY the JULY RELEASE at The Greeting Farm! WOW!! I didn't even think about the hair color coming thru the goggles but once I read it, it totally looked right! Great job! thanks for sharing! Carisa this is FANTASTIC!! WOW! Your coloring is wonderful, LOVE your take on Jen's sketch right down to that adorable button, and that calendar is SUCH a cute idea! GREAT JOB! Congrats on your first TGF release under your belt! So glad to have ya! This is just adorable Carisa, I love it!! Congrats on making the new TGF DT that's just awesome!! Carisa, this birthday calendar is SO cute and such a great idea! You did a phenomenal job colouring Oliver and his goggles! Wow, this is awesome! Thanks for the tip about the hair under the goggles! Amazing card Carisa. Oliver is so cute and you have coloured those goggles beautifully. Perfect!! What a cute card you've made! That stamp is my favorite. Oh this is so pretty sweetie!! Amazing coloring as always!! Oh my...tis is a cutie...Love him!!! And your calender is such a great idea! Wow this is cool! He is such a cute! Good job! carisa!!! this is a fab fab fab card!!! so cute!!! Oh, what a cute little guy, he's adorable. And you colord him beautiful. Such a fabulous image, and your colouring is wonderful, great job. That is an awesome calendar page!! Love it! awww too cute, I just love making calendar pages, and your is super fabulous! I love this little Oliver. I'm still picking my jaw off the floor! Everything about this card is perfect! Great calendar page and I like how you colored the goggles. Wow, beautiful coloring! Amazing job on the goggles! What a great idea with the birthday calendar. Carissa!! This is a gorgeous card!!! I love how you've colored that little boy so splendidly!! Congrats on making the TGF DT!!! Gorgeous creation! WOWZERS!!! Your bday calendar page is Amazing! This new stamp set is totally adorable too! gorgeous calendar page and such a sweet little image. This is just too cute for words! I love how you colored him. His mask looks so real. Awesome job!! This is super cute Carissa! Your coloring is fantastic and I really like this layout! Gorgeous work! What a cutie, Carisa! Thanks for sharing your talent with us! eeek! this is beyond cute! love this little guy. Okay so this is the second day I've visited this dangerous blog..one that i love to linger in. Your cards make me want to stop and hawk and say..why cant my cards look this great? Cute project!! Love your coloring! TFS!! What a gorgeous page for your bday calendar. Such a cute calendar page!!! Carisa~ I bow to your coloring prowess...it's going to be a cold day in...Death valley...before I will be that good! Love the summery primary colors you used! Gorgeous! Fantastic idea on creating a Birthday Calender. I was thinking of a regular calendar but this is even better, you get to keep it for a lot longer. And yes, I know what you mean about the goggles but you did amzing Carisa! !Oliver looks really adorable in his bright sunny colors. I love all the bright colors you used! The thought you put into your work is amazing! he looks so adorable! I love the idea of the birthday calendar. Oh what a cutie! Love the bright colors, and your coloring is fabulous! I simply must him, he's way too cute. Love the way you colored the sunglasses...they look very realistic. OMG is he ever cute! Adorable card and love the papers you used! Your coloring looks great. Love this calendar page. Such a cute calendar page! I love the bright colors. 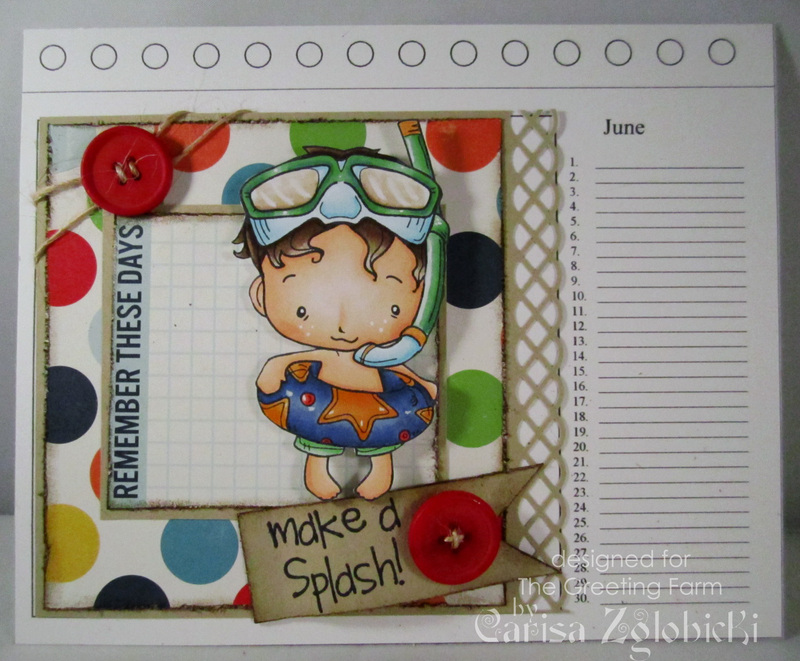 Your calendar page looks great Carisa. Your coloring is fab! I love the colors, and such a cutie with the snorkle! Your coloring is fantastic! Love your cute card so much!! wowee, how adorable. I love these fun summer colours! Oh he is so adorable!!! Love the freckles!!!! This little guy is too adorable - fabulous coloring! Great job coloring Oliver! Your calendar page is adorable! Your calendar looks great! I love that stamp! Carisa this is just Gorgeous! I think your goggles look fantastic and you have captured Oliver's hair underneath the goggles Perfectly! Such a fantastic card and colored perfectly, Love it! I love all the fun bright colors you used in this card, and your coloring job is fabulous! NO no!! That is just too much cuteness for me!! I want to squeeze that little guy lol!! You did an amazing job and the goggles look perfect!! TFS and for a chance to win these cuties!! What a fantastic card!! Makes me want to jump in a pool. Thanks for joining us at Paper Play for our "anything but a card challenge"
WOW I love this!!! I'm going shopping now for this stamp!! Fabulous colours and design.